And though the speeds have been boosted by this feisty session of beam wind sailing, the living conditions aboard Groupama 4 aren't the most comfortable. On deck, it's a real torrent of spray with waves constantly breaking over them. AUCKLAND, Feb 29, 2012 (AFP) - - Camper's hopes of glory in leg four of the Volvo Ocean Race were dealt a blow Wednesday when one of their sails ripped in two, as their rivals threatened to topple the race's 24-hour distance record. 'We're sailing 90 degrees from the wind and 90 degrees from the waves. There's spray and waves on deck all the time. It's really aggressive for the crew, especially for the driver. We all have burning eyes at the moment from the salt. Sailing this way is fun, and it's what everyone thinks about when they sign up to sail around the world. It's also a return to the painful existence of slamming and crashing, only this time it's sunny, wet, and getting hotter by the hour. Leigh McMillan is ruing the day he rang Morgan Larson to ask him if he wanted to get involved in Extreme 40 racing since the American is running his opponents ragged in the opening round of the Extreme Sailing Series in Muscat. by Bay City News A vote by the San Francisco Board of Supervisors on an agreement for the America's Cup sailing race in 2013 will take place a month from now after city officials announced Monday that plans for the regatta have been scaled back. Junior Max Bulger jumped at the opportunity to compete in the Extreme Sailing Series, which began yesterday in Muscat, Oman. For most people, sailing evokes visions of calm lakes, picturesque days on the ocean and "Wedding Crashers" (2005). Salt Spring sailor Richard Clarke and his teammate Tyler Bjorn are hoping they won't be the only two on board when they sail their Olympic dreams to the podium this summer. In fact, they're looking for 2012 people to join them in Weymouth, England. The Optimist Class is the largest and fastest growing International Sailing Class in the world. This is undoubtedly because it is the ideal youth training boat. Volvo Ocean Race: could Telefonica's winning streak end at the hands of Groupama? 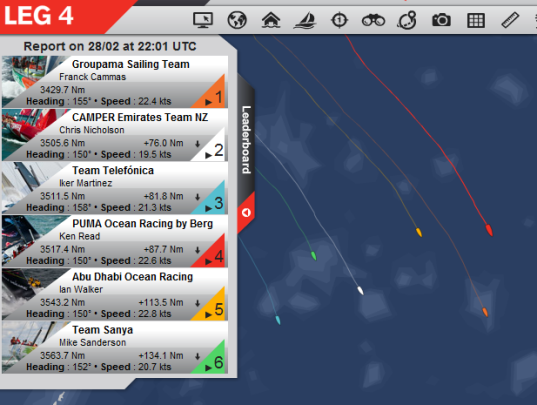 ... stages of Volvo Ocean Race Leg 4 from Sanya to Auckland. Current routing from race HQ in Spain suggests they could cover up to 550 nautical miles in the next 24 hours, and even greater distances during the next four days of trade winds sailing. The arrival of the solid north-easterly trade winds benefitted the easterly boats first with leg leaders Franck Cammas' Groupama sailing team extending their advantage at the front to 55 nautical miles (nm) in the 1300 UTC position report. SAN FRANCISCO (BCN)--The San Francisco Board of Supervisors on Tuesday will consider whether to approve an agreement between the city and organizers of the America's Cup sailing race that will have long-term implications for the city's waterfront. PROUD youngsters at Underhill Junior School on Portland knew the Olympic sailing events are happening this summer. But when asked by island sailing star Megan Pascoe what was happening two weeks later, guesses ranged from 'I'm leaving school? Her sailing teammate, Jean Paul Creignou, started on the water when he was a child in Europe. "When you go sailing, you just step out in the water and you're in a different world right away," says Creignou. "It's just very peaceful. Olympic Rings & Budget make splash! Sir Durward Knowles, who was honoured by organiser Eleazor 'the Sailing Barber' Johnson, said while the regatta was a success he was disappointed that a C Class race was held on Sunday just before the Catch Me If You Can race was staged. Volvo Ocean Race : All on the starting line for South, East or West ? This past week, the World Ice and Snow Sailing Association Championships took St. Ignace by storm. Check out a recap of all the activities. wave.jpg The San Francisco Board of Supervisors on Tuesday will consider whether to approve an agreement between the city and organizers of the America's Cup sailing race that will have long-term implications for the city's waterfront. Team Telefonica's Joca Signorini celebrates a new arrival. Meanwhile, it's official PUMA's move the the north worked and only Franck Cammas has been able to cover the move, looking well placed to reap the rewards on the charge south. The Volvo Ocean Race fleet is coming back to Auckland after 10 years and it will be a homecoming for many sailors across the fleet. Leg four of the race takes the six boats from Sanya in China to Auckland, expected to arrive around March 8. The second annual Team FOR Invitational Regatta for optimist sailors is March 3-4 at the Clearwater Community Sailing Center. By Jared Leone The Team FOR Invitational Regattafeatures sailors aged 8 to 15 racing optimist class boats. The Raileys' typical day may also include other necessary activities such as sponsor obligations, interviews, fundraising activities and, often, travel. There are 10 sailing events in 2012 Olympics, which will run from July 27 to Aug. 12. Crown Series Bellerive Regatta was held on Hobart‚Äôs River Derwent over the weekend. Nick Rogers has added another podium finish to an illustrious summer of sailing, winning the SB3 Tasmanian Championship conducted as part of theRegatta. According to owner Harold Clark, “I just went along for ballast,” when his son Darren helmed the family yacht Invincible to a treble handicap victory in the Crown Series Bellerive Regatta sailed on Hobart's River Derwent over the weekend. Young Tasmanian dinghy and sailboard sailors today gave a fine exhibition of their versatile racing skills and seamanship in winds that ranged from 8 to 30 knots in a demanding day on Hobart's River Derwent in the Crown Series Bellerive Regatta. Formula One sponsor moves into sailing, Sailing Sponsorship news from SportsPro Media Global. I decided that I want to go sailing Whitsundays passage and surrounding islands for my holiday. It was time to get the boat ready, batten down the hatches and. The event titled Twister Regatta starts on 04.21.2012! The famous Sparkman & Stephens 1930 yawl, sailing yact Dorade, has proudly entered the 2012 Caribbean regatta season after a major restoration in the USA. Volvo Ocean Race: ultimate sporting challenge?